What is people thinking about this one? I just read it and loved it. Maybe there are some missconceptions here and there, but absolutely dig the specific theory about Sheriff Station scene being the absolute last scene in the show. Also, i made a pic a few days that fits pretty well with the proposed timing, i think. I don't buy it. How does Cooper saying "The past dictates the future" AFTER he's knows he's already won make sense? Also, why is Diane returning from the alternate timeline but not Cooper? Finally, the writer even admits the episodes don't sync up in parts. Do we think Lynch can't execute his own idea? About the sync part, i forgot he said the specific theory related to the timing was from a previous person. So, thats the part i like, not the sync one. Maybe sync 8 and 17? This is amazing. Thank you ! 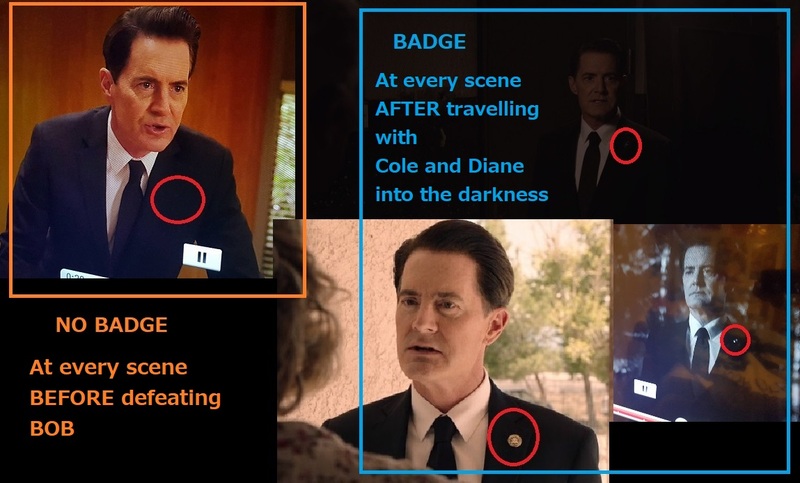 Ive been sayin the pin (perhaps the changing pin), was a clue all along ? Thanks so much for providing this link. And, of course, it would also mean, sadly, that this is truly the end of Twin Peaks. BOB gone. Judy gone. Richard and Linda triumphant. I just did it and it's quite unbelievable. It is 100% deliberate and there are even a few jokes peppered in there. It looks off to begin with but then the sound effects synchronise perfectly, the soundtrack seems to be shared between both episodes and then the editing starts to synchronize, even the acting at times looks like characters are responding to what's going on in the other window. Naido seems to be reacting to Diane's experience the whole way through and it seems that Josie Packard is a Chalfont / Tremond. Perhaps Judy really is her sister. Also Andy tells us that My Prayer is VERY IMPORTANT so I have the feeling that we need to watch episode 8 at the same time as well. A tri-synchronization! I love it! I have no time now to watch both episodes side by side, so I only watch the final scene and...WOW !! !